Persistence. All three readings today speak to us about persistence. In the first reading, Moses held up the “staff of God” while his men battled Amelek and his men. As long as Moses held his hands in the air, the Jews were winning the battle. With the help of Aaron and Hur, Moses persisted and his army was victorious. In the second reading, Paul urges Timothy to be persistent in his preaching whether it’s convenient or inconvenient. And, in the Gospel, Luke tells us the story of the persistent widow. Even the disrespectful judge will finally give in to the widow who continually “bothers” him. Her persistence will eventually pay off. Obviously, if asking over and over sways this human judge, our persistent prayers will be heard and answered by God. But, even though all three readings have a similar topic, each one is different in its application. 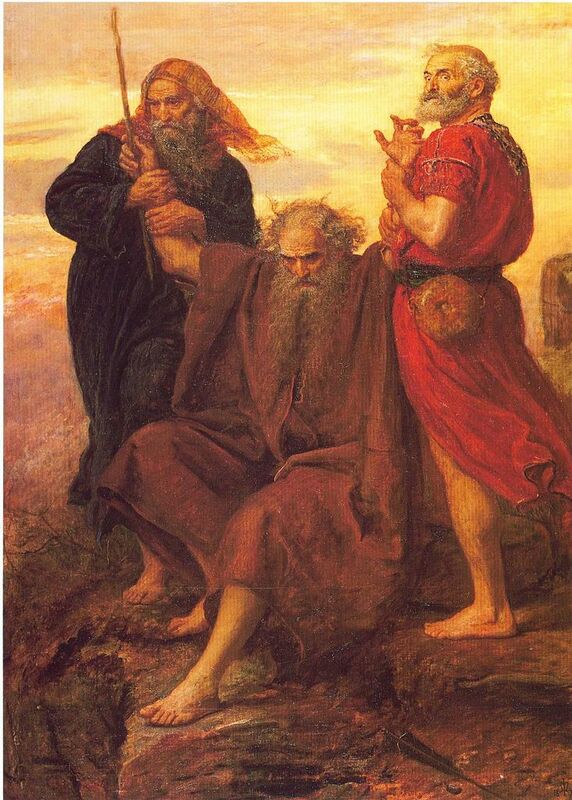 In the Old Testament reading, Moses isn’t able to persevere without Aaron and Hur’s help. God could have given Moses the strength to hold up his arms all day, but He didn’t. Instead Moses had to ask for human help to get the job done. That’s a good example for you and me. We can pray and pray for something but God expects us to do our part. Rather than rely on divine providence to give us what we need, sometimes we have to do something for ourselves. A good example would be someone who’s out of a job. He might get down on his knees and ask God to provide him with a job. But a more prudent solution might be to ask God to give him the tools he needs to find work followed up by sending out a hundred resumes. And, asking friends and family for help, just like Moses asked Hur and Aaron for help can’t hurt either. Persistence in prayer combined with persistence in action will solve a lot of our problems. So, we have three different people, Moses, Timothy, and the widow, with three different problems and three different solutions. Ask for help. Turn to the scriptures. Be persistent in prayer. That’s good advice for all of us. No matter what problems we may have, we should be able to find a solution by using one, or even better, all three. And, be persistent in our actions. 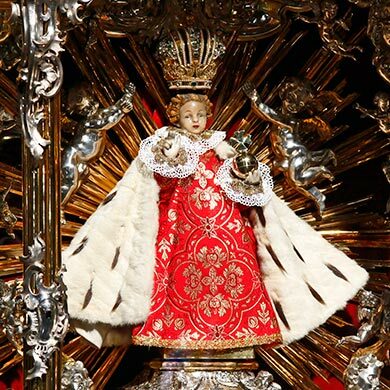 At the end of each mass we pray Father Cyril’s prayer to the Infant of Prague. As some of you may know, the original statue of the Infant is in the Church of Our Lady of Victory in Prague. In 1628 the statue was presented to the Carmelite friars by princess Polyxena who told them, “Venerable Fathers, I bring you my dearest possession. Honour this image and you shall never want”. It was placed in the monastery where devotions were offered twice each day. In 1630 the friars left Prague and the devotions ended. In 1631, during the Thirty Years War, the Swedish army overran Prague. The statue was thrown into a pile of rubbish behind the altar where it remained with its hands broken off for seven years. Father Cyril found the statue in 1637 and claimed to have heard a voice say, “Have pity on me, and I will have pity on you. Give me my hands, and I will give you peace. The more you honor me, the more I will bless you.” Father restored the statues hands, returned it to place of honor and wrote the prayer which we pray to this day. Did the end of the Carmelites twice-daily devotions lead to the fall of Prague? An awful lot of people believe princess Polyxena prophesy was proven true. Our prayer includes the words, “Mighty King, perseverance bestow on thy child; Do shield me and keep me Thine own—undefiled.” At every single mass at Saint John’s, we ask the Infant to give us the gift of perseverance or persistence. We’ve been persistently saying this prayer for sixty-five years! We ask Him to shield us and keep us His own. We promise to share, not just with our friends, but also with our foes, all that is ours. We firmly believe in His powerful aid. We promise to live according to today’s readings. This church has survived urban flight, a deteriorating neighborhood, and two interstate highways. It was on the list of churches to be closed in 2007. But, we’re still here! We’ve hung together and we’re still going forward. Next year will mark our 160th anniversary. I believe the Infant watches over this church and, as He told Father Cyril, the more we honor Him, the more He will bless us. I might mention here, just in passing, that even though I’m not of Bohemian extraction, the Irish have a great devotion to the Infant too. A replica of the statue is often given as a gift at Irish weddings. The Irish particularly believe that the statue has an effect on the weather and it’s often buried in gardens to insure favorable weather for the crops. It’s worth noting that we received our statue here at Saint John’s in 1948. He WASN’T HERE for the tornado of 1896. Coincidence? I don’t think so. So, we continue to pray to the Infant, and we rely on His help, the help He promised Father Cyril. We know in our hearts, that He will be here for us, just as He promised. Remember, Jesus never lies! But we do have to do our part. We make some serious promises in our prayer. We promise to confess our sins and to deplore each and every one of them. We promise to never offend. We promise to suffer for Him. We promise to share what we have with friends and foes alike. In this week’s bulletin I wrote about stewardship; sharing what we have. Whether it’s time, talent, or treasure, as Christians we’re all called to give back some of the gifts that God has given us. We’re called to share with those who are less fortunate and with our fellow Christians through our contributions to the Church. As we make our prayer to the Infant, we should all consider whether we’re doing all we can to hold up our end of the bargain. Sharing doesn’t mean giving back from our excess, it means putting God first. I hate asking for money. I even hate asking for your time. But as a minister of the Church, it is my job to remind you of your obligations. That’s all I’m doing….reminding you of the promise you make to God at every mass. We all have to do our part. Another way you can share is through the various second collections we have throughout the year. Right now we’re being asked to help our neighbors at the Old Cathedral. They’re in the process of a major renovation. We have a lot in common with our friends downtown. We both have historical churches. Besides being houses of God, both buildings are historical landmarks. 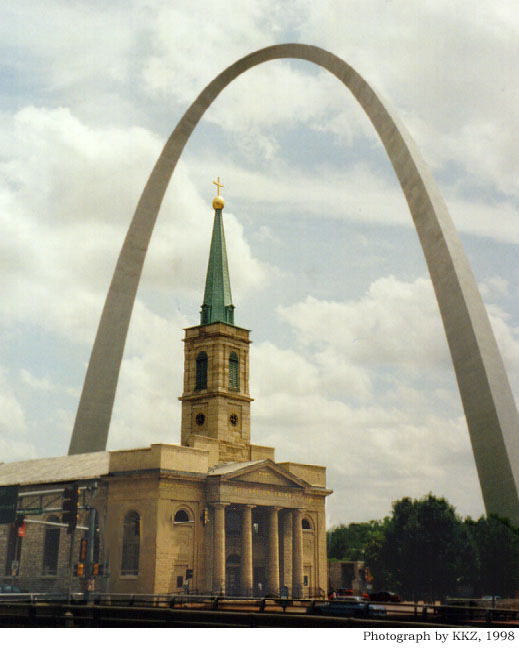 People come to Saint Louis specifically to visit our historic church landmarks, especially in South Saint Louis. The appearance of these buildings reflects on our devotion to God. The big difference between us and them is that millions of people pass the Old Cathedral every year. The church is surrounded by a national park. Sitting between the Arch and the Old Courthouse, the appearance of the Basilica makes an impression on Catholics and non-Catholics alike. The more than 3 million people who attend Cardinal games each year see it on the way to the game along with Rams fans and Blues fans. When any sporting event in Saint Louis is on national television, they’re a good chance that it will appear on screens all over the United States, and even the world. Every Catholic in the Archdiocese of Saint Louis has an interest in the church looking its best. Please be generous to this special collection.